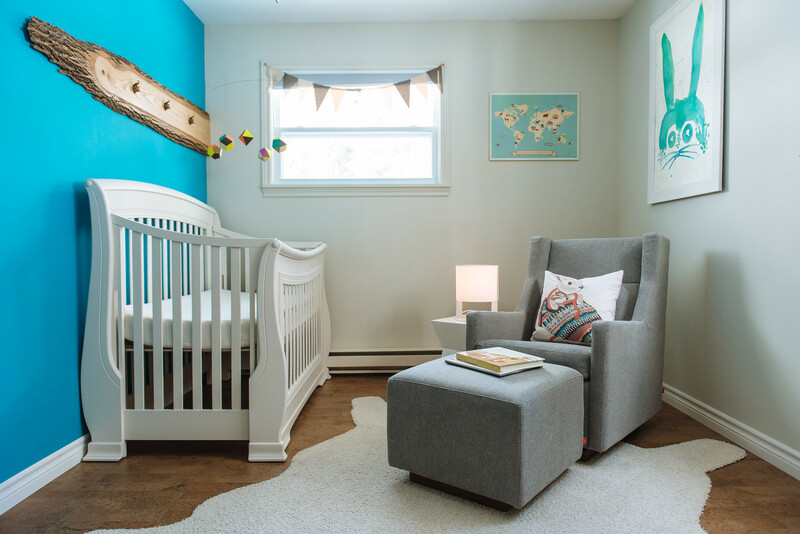 With the pending arrival of their first child, Sean and Carrie McGrath wanted some help changing the room they used as an office into a nursery. As far as ‘Before’ spaces go, this one was hovered somewhere between ‘challenging’ and ‘just plain awful’. With regard to the latter, the office sported dated red wallpaper and was home to an unused sauna! Remember Carrie not wanting anything ‘too Disney cute? Here she picked out a set of Disney chest of drawers with a view to tweaking it. We recommended they remove the rounded sections on each leg, and then we switched out the knobs with two fox and two rabbit ‘Through The Wood Knobs’ from Anthropologie. We then threw in some friends for Jack: Areaware Fauna Pug and Fauna Pico Squirrel cushions designed by Ross Menuez (Tuck Studio.) Note also how all of the trim was removed from the side walls of where the closet doors used to be. Shelves were built to the right to accommodate Jack’s clothing, with a light installed above. The framed sonogram photo (second shelf down on the right) was a Mother’s Day gift from Sean with a special message from “Jack” on the back for Carrie. The book on the top of the storage unit are photos from his birth taken by Nienke Izurieta and Sean McGrath (father). The stuffed bunny was the first baby item Sean and Carrie bought as a couple 4 years before Jack was even conceived. Water Colour by Casile Hayward, a friend of Carrie’s brother. 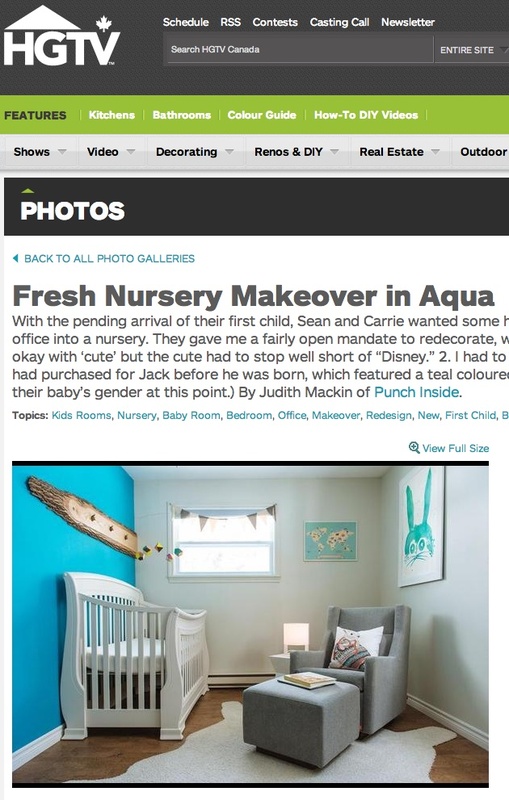 The painting was inspired by Jack’s onesie, which was the creative springboard for the nursery. Baby Jack on the Sparrow Glider wearing the shirt that inspired his room! Five inexpensive décor tips for ‘cute –without going overboard’ ! 1) Adorable building blocks by Areaware Alphabet Blocks designed by Pat Kim through TUCK STUDIO. Vintage metal and wood stool sourced from a second hand store. 2.) FLOR Faux Hide Rug in Bone (comes in many other colours). 3. Switch out regular knobs for Rabbit ‘Through The Wood Knobs’ from Anthropologie. 4. A Live Edge board with hooks for baby’s clothes (Fox ‘Through The Wood Knobs’ from Anthropologie). 5. Add a colourful mobile such as The Themis Mobile (recently featured in Spike Jonze’s film, ‘Her’). 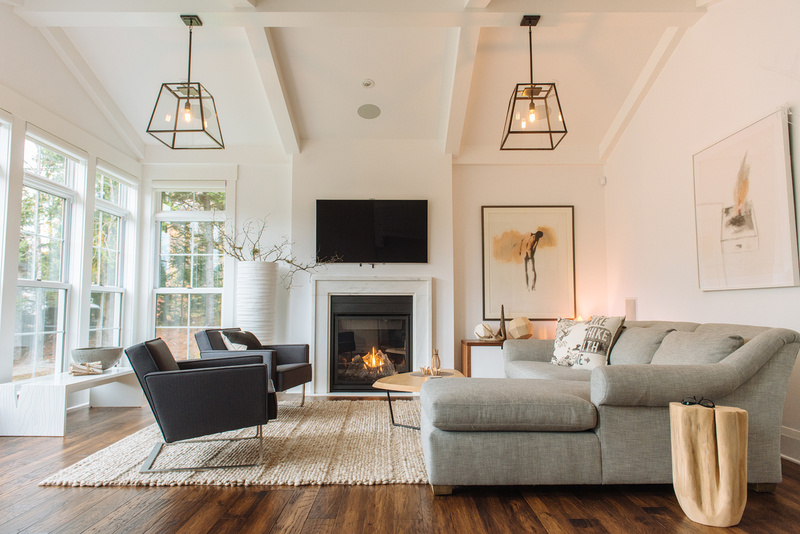 Want to see another radical makeover we designed with Sean and Carrie?